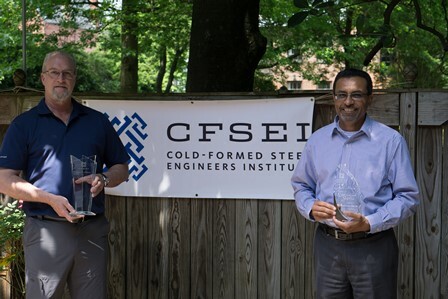 The Cold-Formed Steel Engineers Institute (CFSEI) has named Nabil Rahman, Ph.D., P.E., as the recipient of the 2016 CFSEI John P. Matsen Award for Distinguished Service. CFSEI’s Distinguished Service Award was renamed this year to honor John P. Matsen, P.E., founder and principal of Matsen Ford Design Associates in Waukesha, Wisconsin, who passed away in June 2015. The award, which recognizes the significant contributions of an individual who has volunteered time, talent and resources to the coldformed steel industry, was presented recently during the 2016 CFSEI /MASFA (Mid-Atlantic Steel Framing Alliance) Expo at the Historic Inns of Annapolis in Annapolis, Maryland. 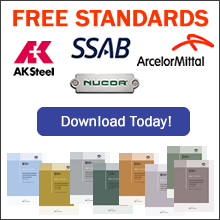 “Nabil is considered one of the premier structural engineers in the cold-formed steel framing industry, recognized especially for his expertise in the areas of blast, impact and progressive collapse,” said Maribeth Rizzuto, LEED AP – BD+C, Managing Director of the Cold-Formed Steel Engineers Institute. “His contributions to our industry are numerous and varied, ranging from inventions to new software products to technical publications and more. At CFSEI, we especially appreciate his leadership at the national level and on several of our committees. He has also been active in our webinar series since it was launched, playing key roles in organizing the sessions, hosting them, and answering questions at their conclusion. His contributions have greatly enhanced the webinar series. 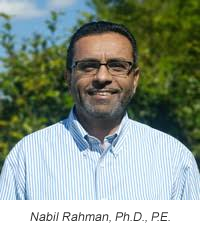 Nabil A. Rahman, Ph.D., P.E. is the Director of Engineering and R&D for The Steel Network, Inc. and a Principal at FDR Engineers in Durham, NC. He is the current chairman of the ASCESEI Committee on Cold-Formed Steel Structures and a past chairman of the Cold-Formed Steel Engineers Institute. Dr. Rahman has vast experience in cold-formed steel design, product development, and software development; as well as the analysis and protection of structures against extreme loads (progressive collapse, blast and impact). He serves as a member of the American Iron and Steel Institute (AISI) Committee on Specifications and Committee on Framing Standards, and is a member of the ASCE Committee on Disproportionate Collapse. He is a named inventor on seven U.S. patents, the technical director of one of the top-used software products in the U.S. for the design of cold-formed steel components, and the author of more than 50 research papers and technical notes.